Black suede and canvas hi-top trainers from the Vans Anaheim Factory pack. 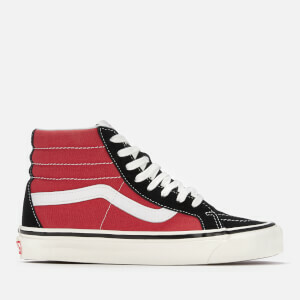 Paying tribute to the first Vans factory in Anaheim, the ‘Sk8-Hi 38’ sneakers are inspired by the original shoe with slightly higher foxing tape, glossed sidewalls and the iconic Sidestripe. Modern UltraCush sockliners and a padded ankle collar provide premium comfort. The trainers sit on Vans’ signature waffle outsole for outstanding grip. Complete with a re-inforced toecap for increased durability, contrast white stitching and a Vans 'Off the Wall' licence plate on the heel.